Filtering: Resetting query before loading data? I set one filter to "Restrict to single value". As soon as I load a new file for the analysis I get the error shown in the attachment. Is it possible to "reset the query" before the data is loaded for the user? Natascha - We can't see the attachment with the error message? Why not post a sampled version of the file with just a few rows and columns so we can see the data values in the field/column in question? Also, why do you think that a free Viewer user can't reset one or all filters? I am not suggesting that they should have too, but just curious...? Hi, here is a sampled version. In the file filter_case.iok there is a restriction to single value for the field "Value1". The first case for "Value1" in the file case1.xlsx is A. If I load afterwards the file case2.xlsx where the first case for "Value1" is B, then I get the error. I can reset, and then everything is fine. However, I am looking for another solution. I am curious to know why you change sources. Are you trying to simulate refreshing of data? A free Viewer can only refresh from a IOK based file source and the file which is going to be opened by free Viewer has to be saved by a Server licence. "Restrict to single value" means filter by this value. In your example, you are effectively filtering by value 'A' and because the value doesn't exist when you change sources, Omniscope is telling you it is converting the old value to an exclusion. There is no way to change that behaviour. Have a text choice variable device which has your choices and then create a formula field that uses this variable to determine if a record has this value or not. Remove this restriction of restrict to single value and show values as category. Well, yes. I am developing the file, so I am simulating refreshing of data. Later on it will be on the server. My understanding is that this warning will happen on the server as well. 1. I need a dynamic solution. 2. I the original file values are a category. Remove this restriction is not really a solution. 3. This is also not dynamic. I dont know in advance what the values are. 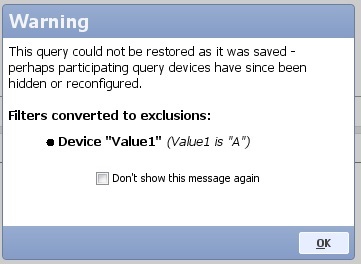 I hope there is an option somewhere in omniscope "Reset all queries before using new source"
Unfortunately, the closest you will get to a dynamic solution is to remove restrict to single value. We may in the future do something that would fix this by making it automatically set the first value if the old value doesn't exist. However, this is not possible at the moment. Have another view whose subset is pointing to "Filtered in" data and showing you all the values, and all other views in the Tab have their subset picker pointing to "Selected data". When the user selects a value it shows those selected records in the views. This achieves a similar idea to filtering, but is based using selection. This solution is dynamic as it would only show you values that are currently present. Can this be reclassified as an idea? Implementing a "reset filters on open" option in the file saving dialogue seems like a good thing to have.